Most people think of tax shelters as being complicated, expensive strategies that only the wealthiest taxpayers use in order to cut their tax bills to Uncle Sam. But what many investors don't know is that a very simple and easy-to-understand investments -- U.S. savings bonds -- offer some attractive tax attributes that can produce unexpected tax savings on your return. Let's take a look at three ways that savings bonds can save you money at tax time. Most people use Individual Retirement Accounts, 401(k)s and other tax-deferred retirement accounts in order to avoid having to pay taxes on their investment income and capital gains until they need the money in retirement. But even when you hold savings bonds outside a retirement account, they give you the same tax deferral as IRAs and 401(k)s, making savings bonds much different from bank certificates of deposit and other more conventional fixed-income investments. %VIRTUAL-article-sponsoredlinks%Ordinarily, with most interest-bearing assets, the Internal Revenue Service makes you pay taxes on the interest income that those assets pay you. Indeed, in some cases, you even have to pay taxes on interest you don't receive, such as in the case of a zero-coupon Treasury bond or an inflation-protected bond. But for savings bonds, you never have to pay tax on the interest you've earned until you cash in the bond. With the maximum maturity period on savings bonds of 30 years, that can save you from high taxes for decades while you wait to find the best time from a tax perspective to cash them in and use the money. Once you cash your savings bonds in, then you'll generally owe federal income tax on the interest. But as with other U.S. government obligations, you won't have to pay any state income tax that would ordinarily be due on interest income. Although all Treasury bonds share this tax-free trait at the state level, many other income investments, such as bank CDs and corporate bonds, are subject to state income tax and thereby reduce your after-tax return. One great benefit of savings bonds is that if you use the proceeds from a bond redemption to pay qualified educational expenses, then you could be eligible to exclude the interest income entirely on your tax return -- effectively paying no tax at all. To qualify, you have to have been 24 or older when the bond was issued, your income has to fall below certain limits, and you have to pay tuition and fees for yourself or a spouse or dependent. For 2013, the benefit begins to phase out for single filers above $74,700 in gross income and joint filers above $112,050, completely disappearing at levels $15,000 and $30,000 above those respective figures. 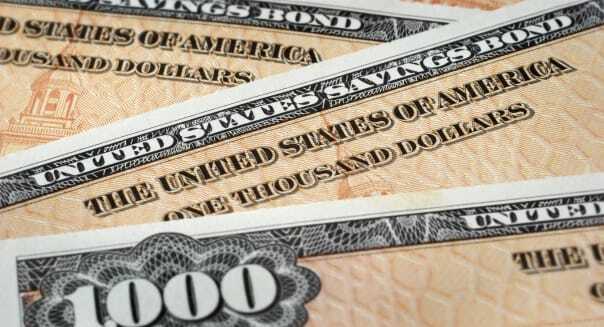 The downside to savings bonds right now is that because interest rates are low, the amount of income you'll get from investing in savings bonds is limited. Currently, Series I savings bonds pay 0.2 percentage points above inflation, which equates to a 1.38 percent rate for the first six months. Series EE bonds pay just 0.1 percent, but they're guaranteed to double if you hold them for 20 years, equating to an annual rate of 3.5 percent. Nevertheless, with these tax breaks, savings bonds are worth considering. For more information on savings bonds, check out the U.S. Treasury's website at savingsbonds.gov.